On this page we will look at the amazing Woodpecker. If you have any interesting or funny facts about animals or would like to find out more information about a particular animal, please fill up the Feedback form and we will be happy to add it to our list of animal facts. How do woodpeckers peck all day without getting a headache? Woodpeckers are best known for their habit of chiseling holes in trees for nests and to hunt insects. When they are drilling, they can peck about 15 to 16 times in a single second. Woodpeckers will also drum on tree trunks to signal other woodpeckers. All this drilling and tapping adds up to about 12,000 pecks a day. So how come the woodpeckers don’t get splitting headaches afterwards? First, woodpeckers’ brains are small and attached firmly to their skulls. This ensures that the shock from the impacts is distributed evenly. Second, there is a layer of shock-absorbing tissue between their skull and their bill, which helps to lessen the force of the impact. Besides protecting their brains, woodpeckers must also protect their eyes and noses from splinters and sawdust when they are drilling. In the millisecond before the woodpecker’s bill strikes the wood, a thick membrane closes over its eyes to keep out debris. The woodpecker’s nostrils are slit-like and are protected by special feathers. Woodpeckers also have to anchor themselves firmly to the tree they are drilling into. Their feet have four clawed toes, two pointing forward and two pointing backward. This allows them to grasp the tree trunk. Their stiff tails are used to brace themselves while they are drilling. 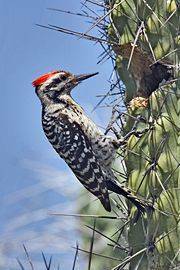 A picture of a woodpecker and its cactus nest. Woodpecker Fends Off Squirrel An acorn woodpecker guards its stash from a very persistent squirrel. Below is a video of a woodpecker pecking a tree. Woodpeckers are important members of the forest community. They consume gobs of wood-boring insects. And abandoned woodpecker cavities are real estate for bluebirds, chickadees, owls, squirrels and other wildlife unable to dig out their own homes. Seven species of woodpeckers are commonly found in the Midwest, and several will visit bird feeders supplied with suet or sunflower seed. A field guide and a pair of binoculars will help you identify which of these birds live in your neck of the woods.